Records Flow, pH, Level, or any Analog or Temperature Value. The MRC 5000 is a digital circular chart recorder capable of measuring, recording and controlling (optional) up to two process variables from a variety of inputs. Designed with the latest innovations in recording technology, enclosures and functionality, the digital circular chart recorders are slim, trim and simple. Finding a place to install this digital circular chart recorder is easy, with its compact panel depth and short protrusion from the front panel. The digital circular chart recorder's mode switch, located next to the large red LED display, provides two functions. When in the PROG/CAL/TEST position, the digital circular chart recorder provides access to program parameters, calibration facilities and test functions. Digital circular chart recorder options are matrix selectable and are shipped with default settings. The versatile MRC 5000 digital circular chart recorder accepts 4-20mA or 20-4mA inputs as well as mVDC, VDC, thermocouple and RTD inputs. Changes in input type are easily programmed in the digital circular chart recorder in the field. With the digital circular chart recorder's universal power supply (90–264VAC line voltage at 50–60Hz), the MRC 5000 can be installed just about anywhere. Each MRC 5000 digital circular chart recorder ships with a box of 100, 0-100/24 hour,10” charts. Choose from the digital circular chart recorder models and features listed below or call us for optional equipment including: controller version, NEMA 4 case, RS485 communications port and different chart ranges. DC Milliamps: 0–20mA; 4–20mA; internal 4.7ohm shunt resistor. 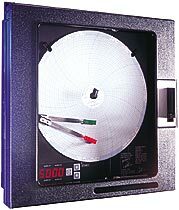 Thermocouple: J, K, T, R, S.
Circular chart recorder includes one pen input and no relay outputs with a Nema 3 case. Circular chart recorder includes two pen inputs and no relay outputs with a Nema 3 case. Circular chart recorder includes one pen inputs and one relay outputs with a Nema 3 case. Circular chart recorder includes two pen inputs and two relay outputs with a Nema 3 case. Pen for input 1, 5 chart paper pens per pack. Pen for input 2, 5 chart paper pens per pack. NOTE: A three box minimum order is required.